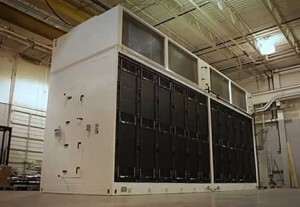 Modular data centers became popular when the economy started to swirl the drain. Businesses needed new ways to secure funding in small amounts while simultaneously decreasing the risks that came with creating a data center. Two of the main gripes with traditional data centers are the speed at which they could be deployed and revenue. It takes an abundance of both time and money to construct a building to house a traditional data center. Something else to bear in mind is that advancing technology encourages businesses and organizations to shift their focus to scalable and rapid modular data center designs. Besides these two reasons, there are several other reasons that a modular data center is preferable to a traditional data center. From the original order to the deployment, modular solutions offer an extremely fast timetable. The reason for this is that they’re designed to be able to be personalized, ordered and shipped to data centers in a matter of months of less. Modular data centers also allow for a parallel dependent transition as opposed to linear dependent transition when it comes to construction. Since they have a design that can easily be standardized and repeated, it’s no problem to match scale infrastructure and demand for modular data centers. The only limits on modular scale are the foundational infrastructure at the data center site and the open area that’s available. Another aspect of scalability is the ease it allows by having modules that can be efficiently and quickly be replaced if the technology ever needs to be upgraded. What this means for businesses and organizations is that they can predict shifts in technology a matter of months in advance. Scalability for modular data centers is not only determined by how quickly the proper environment for a data center can be set up. Having an agile data center foundation is the same as swiftly being able to satisfy the needs of a growing and shifting business. Such needs might include creating a revolutionary new service or cutting down on downtime. It’s all about agility. Some business want a data center for the sole purpose of capacity planning while others like modular data centers because they have some of the best disaster recovery operations. Something else to think about with modular data centers is that they can be delivered anywhere in the world that the end user desires. Rather than delivering the center all at once, a data center can be delivered and re-assembled rapidly once it arrives at its final destination. Such mobility can be one of the top selling points for businesses and organizations who make disaster recovery one of their top priorities since modular data centers can be shipped to a recovery site, put back together and have the organization running in very little time. One of the disadvantages of modular data centers is that some of their standard configurations have a limited value for organizations and businesses that want high-performance computing, in addition to the heavy cooling and power requirements that come with them. If owners were to take a look at the cost analyses, they might see that they would see very little to no savings if they were to have a module installed anywhere outside of the data center. Site preparation work would still need to be done, which requires utilities to be brought over and trenching, both of which cost money. When looking at it this way, it would actually be more affordable to have a traditional data center constructed. Being locked in with a single vendor is something else that organizations worry about when it comes to modular data centers. The reason they might not want to be locked into a contract with a single vendor is that the organization or business might not have as many choices in the models and brands of internal components or the choices of terms of service if something were to ever go wrong with the data center. Being stuck with a vendor also means that data center owners aren’t able to keep looking for lower cost repair and maintenance services. Those looking into data centers also have to bear in mind how well they’ll work with the resources they already have. The infrastructure management applications of a data center have a main console for keeping an digital eye on a vast network of resources, such as virtual and physical servers and power distribution and cooling centers. If a modular data center has DCIM capabilities of its own, it will most likely be able to work in conjunction with standard interfaces for swapping information with the organization’s existing DCIM systems management applications or programs. To keep from having to supervise modules separately as opposed to part of the whole, it’s best that buyers ask for a rundown of specifics on how open the modular unit is. If you want a data center that’s based on open standards, it’s best that you have a list of primary standards to show the data center company since not everyone has the same idea of what open standards are. This will keep you from wasting time and possibly money to clear up the confusion before you and you modular data center up and running. Modular data centers are an engineered product, which means that their internal subsystems are intricately integrated in order for them to be more efficient when it comes to both gaining power and cooling the module. Pure IT and first generation modules will more than likely not have the same levels of efficiency gains as those that have similar containment solutions within a traditional data center. In order to save funds on distribution gear and to avoid power loss from close proximity, it’s suggested that you set the data center’s power plant relatively close to the IT servers. You’ll also find that you’ll have chances to make use of energy management platforms inside of modules, with every subsystem being created as a single piece. Do your homework and plenty of research before making a final decision on whether you should get a modular data center or a traditional one. If you’re looking for efficiency, easy setup, resiliency and scalability, you’ll more than likely benefit from a modular data center. This entry was posted in Construction Industry. Bookmark the permalink.